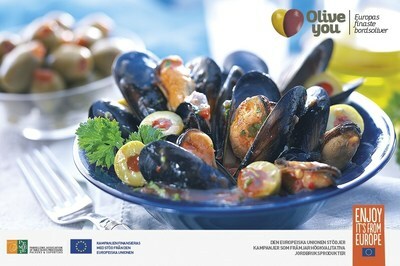 NEW YORK, Feb. 5, 2019 /PRNewswire/ – "Olive You" European Table Olives Campaign presents a delicious savory Olive recipe for Horderves that will excite your guest's taste buds. Part of the Mediterranean diet since antiquity. A favorite food in Mediterranean countries, it has been a snack for a hundred years and still is today. An important component of the healthy Mediterranean diet. Peel the onions. Cut off the tops and scoop out the core (as you would do with stuffed tomatoes), save at least two layers. Chop the onion cores. Transfer olives into a frying pan, add the chopped onion and braise for 2-3 minutes until the onion is golden. Add the cheese, the fennel, the olives, the pomegranate seeds, the garlic, salt and pepper. Leave on the burner for one to two minutes to allow the tastes to marry. Fill the onions with the mixture and place them on a baking sheet. Bake on medium heat for 15 minutes. Serve warm.